Below are the clubs notes and the date on which they appeared in the local press. To see the notes for the few years, take a look through the relative archive section of the site. Thank you to all our supporters and promoters. We played Granard in Divison 1 League – Round 2 last Friday, 6 th April, in McGann Park, Kenagh. Although we were ahead by 2 points going into the second half, luck was not on our side, despite all the players giving their all. Final score was Granard 3-10 Ballymahon 1-11. Thank you to Kenagh GAA for the use of their pitch. Thank you also to Granard GAA for agreeing to change the game to Friday. And a big thank you to Macs Shack, Kenagh for providing food for both teams after the game. It was greatly appreciated. We are playing Dromard in Round 3 next Saturday, 14th at 6.30pm in Dromard. Best of luck to the team and management. Please come and show your support. Congratulations to Emmet Finn and Natasha Nally on their marriage last Saturday, 7 th April. May your years ahead be filled with joy and happiness. We were away to Dromard last Saturday for Round 3 of the Division 1 league. The final score (Dromard 1-14 Ballymahon 0-7) does not in anyway reflect the game against Dromard. It was nip and tuck all the way and with 10 minutes to go before the final whistle we were only 1 point down. Hard luck to the team & management. We are at home to Longford Slashers in the next round on Saturday 21 st April, at 7pm. 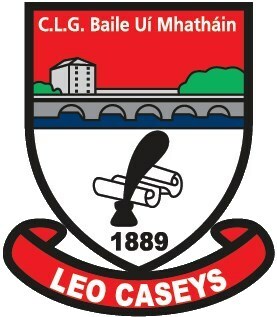 We would love to see a crowd in Leo Casey Park to support the lads. Best of luck to all! Copyright 2009 Ballymahon GAA Club. All rights reserved.